"Nightman" was a syndicated, live-action superhero television series. 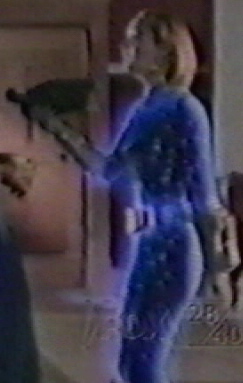 The character of Nightwoman appeared only twice throughout the series, each by a different actress. Both actresses did a commendable job and are as pretty as can be. 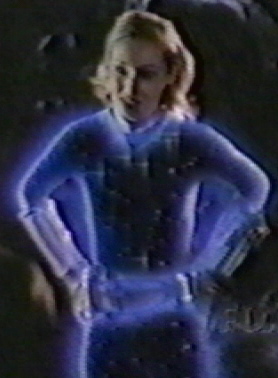 Deanna Milligan played Lorrie Jarvis aka Nightwoman in the episode "Nightwoman Returns" from May 10, 1999 during the show's second season. Ms. Milligan looks different than Ms. Campbell (Nightwoman #1), but is still very pretty and appealing. Jen Campbell was tall (5' 10") and looked like she could beat up some big guys. Deanna Milligan is shorter and a little more slight so it wouldn't be very convincing to see her throw around some big, ugly criminal. In this episode, Nightwoman doesn't get that physical. She uses her stun blaster to knock out opponents. Deanna has that pixie-like quality, like Tinkerbell, which is very cute. She also gives a lot of intelligence to the character of Nightwoman. This time around, Nightwoman is wiser and not as headstrong as she was in her first appearance. She has to be: she's a mercenary-for-hire. Lorrie Jarvis still has the same cool bodysuit outfit with the glowing stars and this time she is actually called "Nightwoman". She's a much happier person now, no doubt due to the fact that she settled the score with her old enemy in her previous appearance. Also, we learn at the beginning of this episode that Lorrie Jarvis had an operation which allows her to walk normally again without having to depend on the Nightwoman suit. It's good to see Nightwoman as a definite "good girl" crimefighter. Overall, she's very hopeful and optimistic this time, fighting for what is right. Nightwoman goes night-night. Zapped into submission by a voodoo priestess!